Received the sequencing data from ZymoResearch for the <em>Crassostrea virginica</em> gonad MBD DNA that was sent to them on 20180207 for bisulfite conversion, library construction, and sequencing. This entry was posted in Miscellaneous and tagged BS-seq, Crassostrea virginica, Eastern oyster, Illumina, MBD, ZymoResearch on 29 March, 2018 by kubu4. Continued MBD enrichment of C.virginica DNA from yesterday for Qiagen project. Followed the MethylMiner Methylated DNA Enrichment Kit (Invitrogen) manufacturer’s protocol for input DNA amounts of 1 -10ug (I am using 8ug in each of two samples). The rest of the ethanol precipitation procedure was followed per the manufacturer’s protocol. Final pellets were resuspended in 25μL of Buffer EB (Qiagen) and stored temporarily on ice for quantification. This entry was posted in Miscellaneous and tagged Crassostrea virginica, Eastern oyster, EtOH precipitation, MBD, MBD enrichment, MethylMiner Methylated DNA Enrichment Kit on 10 January, 2018 by kubu4. Continued MBD enrichment for C.virginica and Qiagen project from yesterday. Performed a single, high-salt elution. Samples were precipitated O/N @ -80C. This entry was posted in Miscellaneous and tagged Crassostrea virginica, Eastern oyster, MBD, MBD enrichment, MethylMiner Methylated DNA Enrichment Kit on 9 January, 2018 by kubu4. 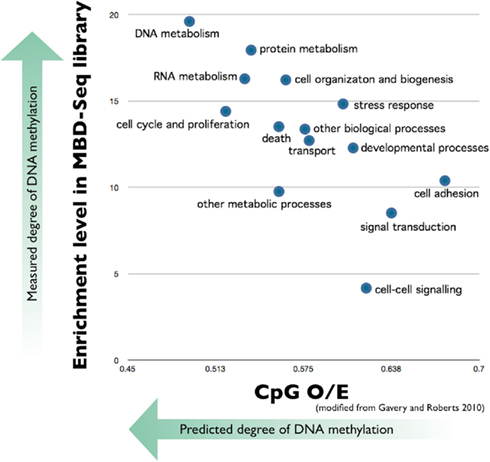 Prior to bisulfite sequencing we did do a couple of MBD enrichment libraries to describe DNA methylation in oysters. Results even were snuck into this perspective. While I am sure there are genome tracks around, I am ending up #doingitagain. 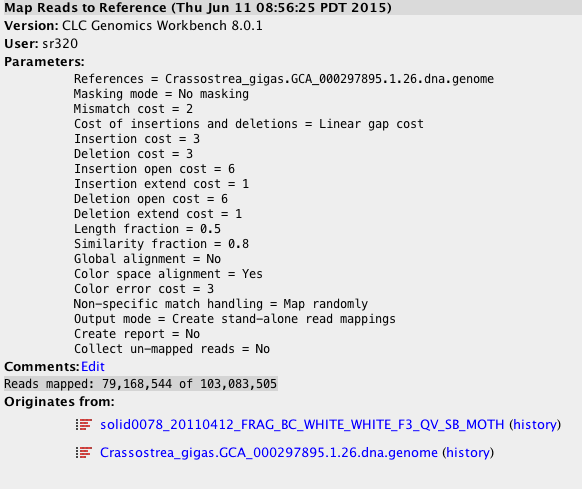 In short I took the raw Solid reads, align to Crassostrea_gigas.GCA_000297895.1.26.dna.genome in CLC, exported bam, converted to bedgraph, converted to tdf. Rinse and repeat with unmethylated fraction (UNMOTH) and import tdf into IGV! 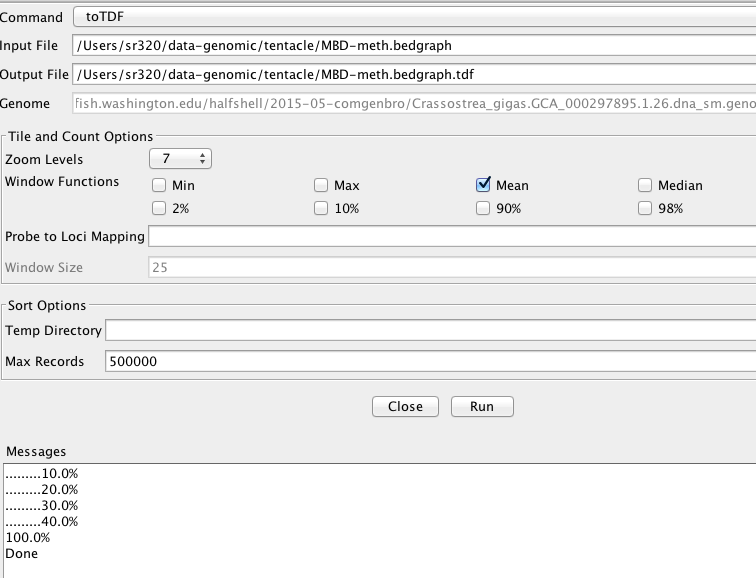 This entry was posted in Cgigas DNA Methylation and tagged bam, bedgraph, bedtools, clc, igv, MBD, tdf, visualization on 12 June, 2015 by Steven Roberts. This entry was posted in LSU C.virginica Oil Spill MBD BS Sequencing and tagged BS-seq, checksum, code, Crassostrea virginica, curl, Eastern oyster, HiSeq2500, LSU, MBD, md5, oil on 9 February, 2015 by kubu4.